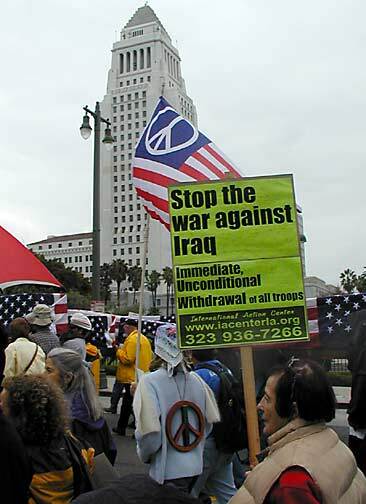 Photos from the massive downtown Los Angeles antiwar march and rally. Local television stations reported between 5 and 7 thousand demonstrators. The antiwar movement is once again on the march - and this time we're not stopping until the troops come home! The great awakening has begun! 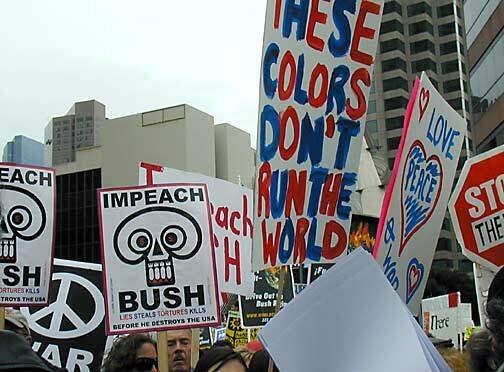 It wasn't the biggest antiwar march ever held in Los Angeles, that's coming soon, but the January 27th L.A. march marked a real sea change. 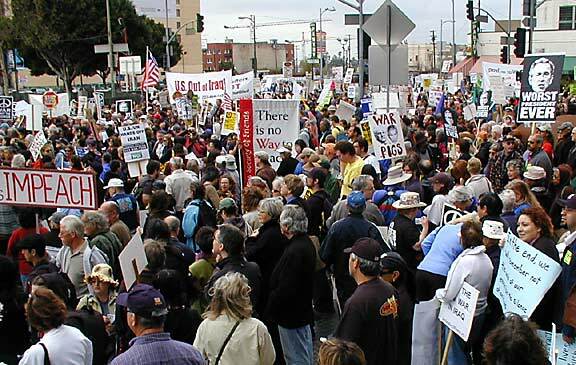 At the start of the march, thousands gathered at the Democratic Party headquarters (where this photo was taken), to put the Dems on notice, "The antiwar movement is watching you - and we expect you to cut funding for this war." 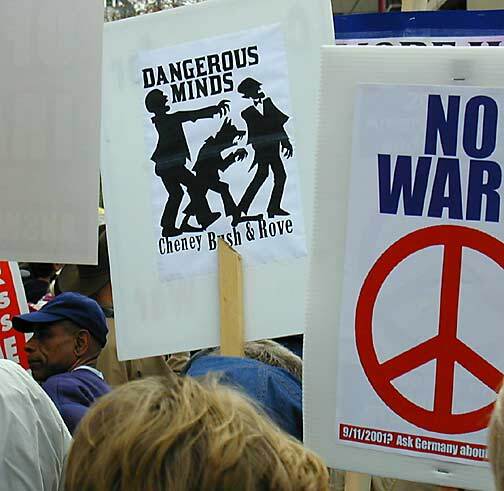 America's antiwar movement is not only back, it's bigger, smarter, and determined to have its way. 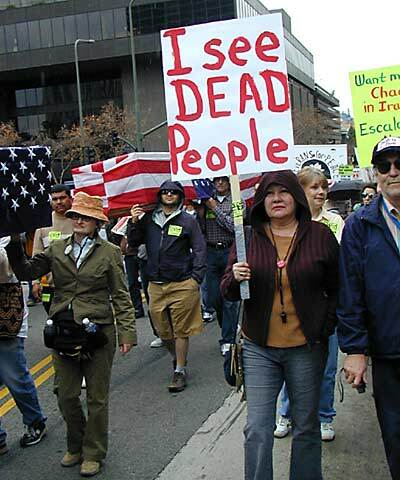 Everyone was at this demonstration, and by that I don't mean the usual suspects, I mean EVERYONE. Middle class housewives danced with Aztec warriors. Korean drummers exchanged telephone numbers with African American union activists from San Pedro. Punk rockers marched alongside Iraq war veterans while downtown artists decided to join the revolution and start making art for the movement. The police thought about quitting their jobs and starting new careers, while corporate news crews desperately sought out someone from Indymedia they could surrender to. I'm telling you.... the great awakening has begun! So many signs! One of my favorites read, "WE'RE THE DECIDERS!" That's right baby! We're here and we're taking the country by storm! Hillary doesn't lead us! Obama doesn't lead us! The Republican politicians CERTAINLY don't lead us. We lead, they follow. We speak, they listen. No compromise.... democracy is coming to the USA. 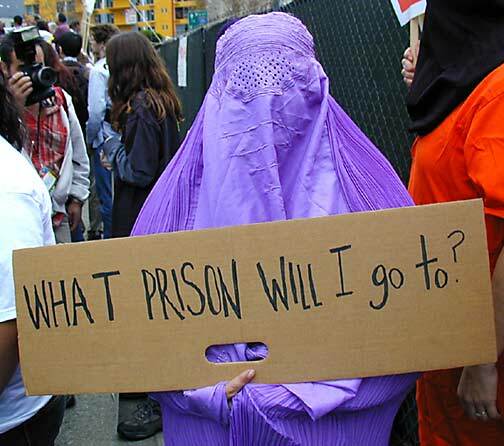 Your future cell mates at Gitmo. 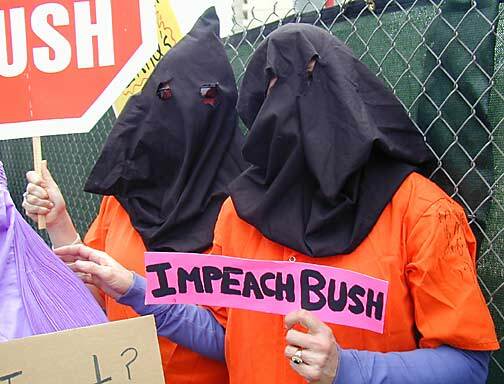 Of course, if democracy wins and plutocracy looses... you won't have to go to Gitmo. Instead, Bu$hco. Inc. will be wearing the funny little orange jumpsuits. Entire nations turned into jails! The U.S. "liberates" women by installing right-wing fundamentalist regimes. Oh yes... America loves the poor people of the Middle East and wishes to free them - of their oil! Let's see now, America controls Afghanistan while that country harvests a bumper crop of opium. Heroin epidemic in the U.S. - NO CONNECTION. NOTHING TO SEE HERE PEOPLE, JUST MOVE ALONG! The ONLY Commander in Chief WE follow is Martin Luther King Jr.
Left behind in the Gulf States, left behind in the Gulf. Need a job, join the army, but don't expect veteran's benefits when you come home with half your body and mind missing. Remember, real Americans pull themselves up by their own bootsraps. It's sink or swim, pal. Watch 'em sink in the mud of Luisiana... watch 'em sink in the sands of Iraq. Can you see them as well? "I don't wanna see them... I wanna go shopping. I support my president, he knows what's best, and he says we should support his war on terror by acting like nothins wrong, otherwise the terrorists win. We should shop and spend lots of money on our credit cards and show the terrorists that we're not afraid. We can show support for our troops and the war effort by buying HUMVEES that look just like the ones they drive around in Iraq (except ours will look so much spiffier with all that crome), that way we can have vehicles big enough to carry all the stuff we purchase at shopping malls to show the evil doers we are not affaid of them and that we are sacrificing for our country!" At the end of the demonstration, thousands of marchers walked directly passed Los Angeles City Hall. Mayor Antonio Villaraigosa went into hiding on the day of the march. 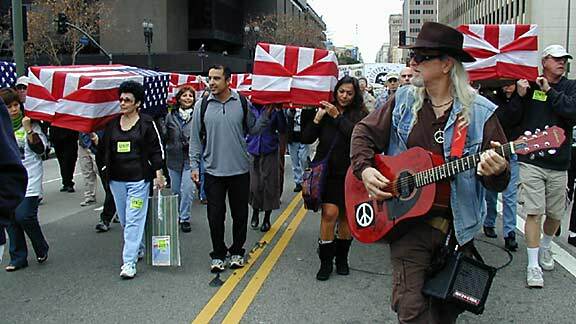 He did not speak before the 7,000 or so Angelinos who marched against the Iraq war, and he released no statement supporting the demands of the antiwar marchers. Instead, in his weekly radio address, he made an appeal to the Republicans, "In Iraq and here at home, it's time for a new direction. We must stop talking about challenges, like energy, and work together to solve them." The ONLY "new direction" for Iraq we are interested in is the one that points out the IMMEDIATE DIRECTION HOME for U.S. Troops! 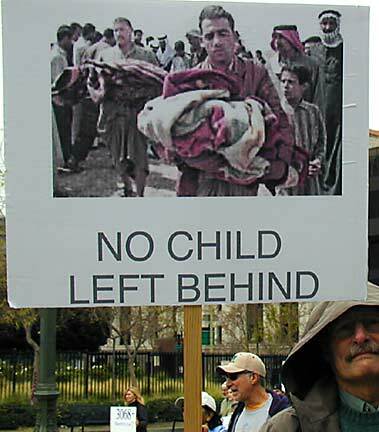 Remember - Mayor Villaraigosa attended a pro-Israel rally on July 23rd, 2006, to show his "support for Israel" as it was bombing Lebanon into the stone age. THAT HE CAN DO - but he can't address the people of L.A. to say that he supports what the majority of Americans want - an immediate withdrawal of U.S. troops from Iraq! 3,075 Coffins and More On The Way. Dozens of flag drapped coffins are placed on the steps of Los Angeles City Hall. How many more thousands of U.S. Soldiers will die in this bloody war for oil? 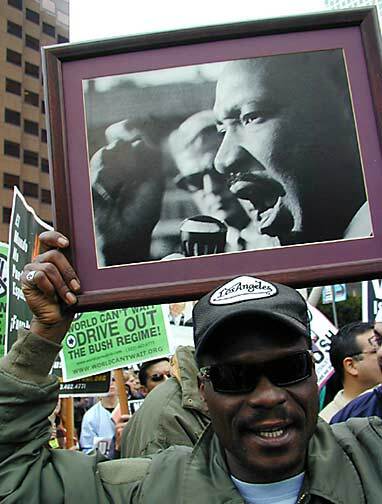 Where was Mayor Villaraigosa hiding when the people of L.A. marched in their thousands to demand an end to this war? Where was his statement of support for the antiwar movement? "Lies, Steals, Tortures, Kills - before he destroyes the USA." A sea of signage. "These Colors Don't Rule The World." 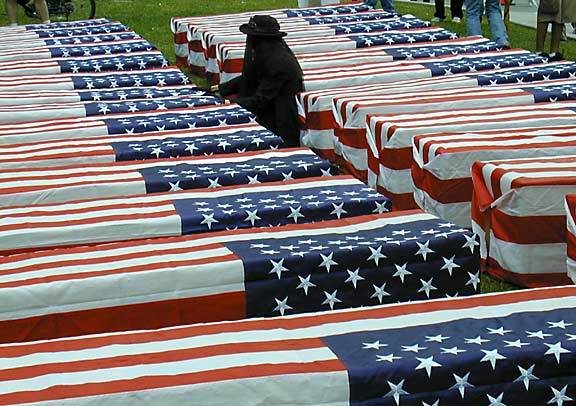 Marchers carrying dozens of flag drapped coffins representing the thousands of American G.I. 's killed so far in this war for oil.